The Lochbrow Landscape Project is co-ordinated by Dr Helen Goodchild, Dr Dorothy Graves McEwan and Dr Kirsty Millican. It is an ongoing research project investigating the archaeological sites and landscapes at and around Lochbrow in Dumfries and Galloway. Lochbrow is around 2.5km south of the village of Johnstonebridge, and about 10km north of Lockerbie. During the 1980s and 1990s aerial survey recorded a number of archaeological sites as cropmarks at Lochbrow, indicating the presence of a complex of prehistoric sites. The sites recorded include a timber cursus (a long enclosure defined by timber posts), one, possibly two, timber circles, and round barrows. Timber cursus monuments are an Early Neolithic monument form found only Scotland, with around 26 known to date. Timber circles and round barrows are more common phenomena found throughout the British Isles, dating from the later Neolithic to the Bronze Age. On the basis of previous research, it was suggested that the cursus may have been very closely connected to its landscape setting. 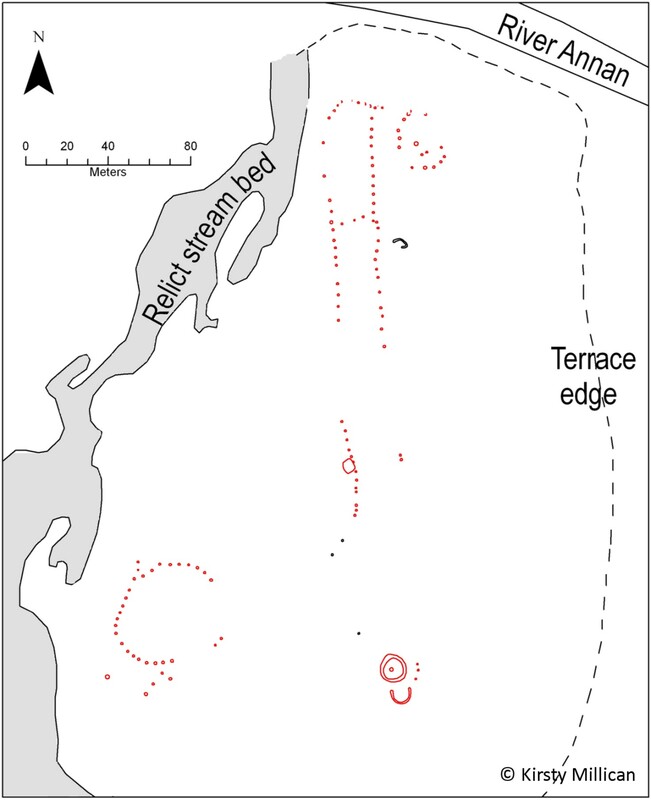 While, at around 48m across, the more certain timber circle is one of the largest so far recorded in Scotland. So these are very intriguing sites. As well as this, the formation of cropmarks varies considerably at Lochbrow so it was hypothesized that unresponsive areas could mask additional features. This suggested to us that more may remain to be discovered. Consequently we considered this a monument complex that would benefit from intensive investigation. Map of the cropmarks (in red). The dominant topographical features are also shown. The cursus is oriented north-south, the timber circles lie to the east and southwest of the cursus and the barrows to the south. The first stage of the project has concentrated on the earliest monuments as the likely initial focus for prehistoric activity in this location. A pilot gradiometry survey in November 2010 indicated higher resolution geophysical surveys might improve our understanding of the area. Therefore, detailed topographic, gradiometry and resistivity surveys followed from September 2011 to 2015, combined with soil coring and experiential archaeology. The second stage of the project broadened the investigation to consider the subsequent development of the monuments at Lochbrow within its wider surrounding landscape. This involved the expansion of the geophysical surveys to investigate additional cropmarks, of later date, to the south of the initial survey area. These include two later prehistoric palisaded enclosures and a round barrow. 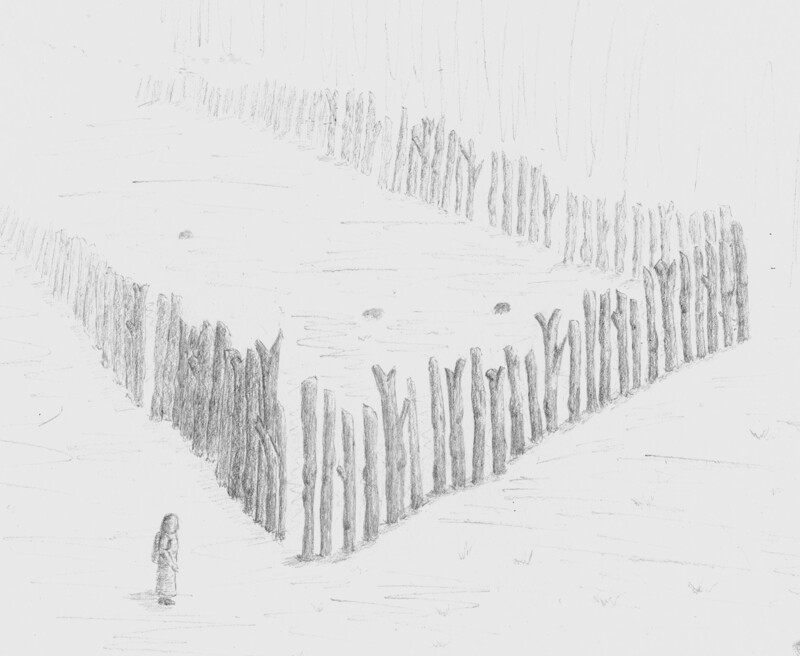 Reconstruction drawing of a cursus monument, based on a timber cursus excavated at Bannockburn © Kirsty Millican. gain a better understanding of a complicated, multi-period site, with a specific focus upon the Neolithic elements. study the wider location of this timber monument to investigate the possibility of additional activity around the location of the monument, not recorded as cropmarks. Hi – If you can make use of (additional?) aerial photography (using an Unmanned Aerial Vehicle – UAV – or “drone”), I am resident in Auchencairn (Castle Douglas) and currently going through the process of qualifying for a Civil Aviation Authority licence to operate a UAV aerial photography business. Whilst going through the licencing process I would be interested to assist (pro bono) with your project – if there would be any value to you, or if you would like to explore the possibilities.